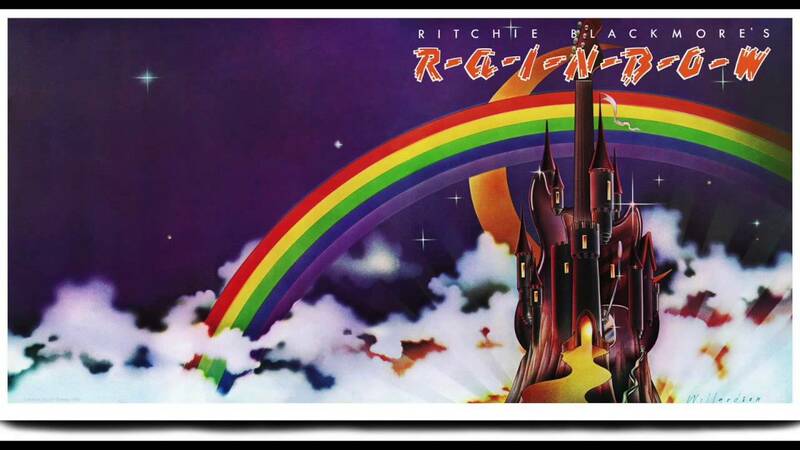 Ritchie Blackmore’s Rainbow is the name of the debut album by guitar god Ritchie Blackmore and his first post-Deep Purple band named, of course, Rainbow. The record hit stores on August 4, 1975 and immediately established that, as masterful and multifaceted as he’d been in Purple, the six-string sorcerer named on the cover possessed far more bedazzlement up his cloak sleeves with which to bedazzle the world. To celebrate the 40th anniversary of Ritchie Blackmore’s Rainbow, here are 40 facts surrounding this monumental musical landmark. Come, now— let’s catch the Rainbow. 1. Rainbow arose after lead guitarist Ritchie Blackmore departed Deep Purple in 1974 following the group’s Stormbringer album. 2. Deep Purple had been in a state of continual flux since its 1968 debut, going through three major frontmen (Rod Evans, Ian Gillan, and David Coverdale), while transforming from progressive rock to proto-metal en route to what Ritchie Blackmore saw as something headed in the direction of soul music and heavy funk. 5. Both “Black Sheep of the Family” and “Sixteenth Century Greensleeves” appear on Ritchie Blackmore’s Rainbow. 6. The name Rainbow was, at least in part, a tribute to the Rainbow Bar and Grill, a legendary, still-thriving hard rock hangout on Los Angeles’s Sunset Strip. 7. The very first version of the band Rainbow consisted essentially of the existing hard rock group Elf, with the addition of Ritchie Blackmore on guitar and guest cellist Hugh McDowell of the Electric Light Orchestra. 8. Elf’s self-titled 1972 debut was produced by Deep Purple bassist Roger Glover and drummer Ian Paice. 9. From 1972 through 1975, Elf regularly opened for Deep Purple in concert. 10. The member of Elf with whom Blackmore bonded especially well, both musically and in a shared sense of humor, was their physically tiny, sonically gigantic lead vocalist. He was a spirited American bloke by the name of Ronnie James Dio. 12. Blackmore’s personal friendship and creative cohesiveness with Dio ultimately motivated the guitarist to finally break away from Deep Purple. 13. Deep Purple officially announced that Ritchie Blackmore would no longer be their guitarist on June 21, 1975. It wouldn’t be the last time. 14. Ritchie Blackmore’s Rainbow had originally been intended as a Blackmore solo project, but both he and Dio decided to keep the endeavor going as a full-fledged band. 15. “Black Sheep of the Family and “Sixteenth Century Greensleeves” were recorded in Tampa Bay, Florida toward the end of 1974. 16. The remainder of Ritchie Blackmore’s Rainbow was recorded at Munich, Germany’s famed Musicland Studios. 17. Other major rockers who recorded at Musicland include Led Zeppelin, the Rolling Stones, Queen, Elton John, ELO, T. Rex, and Sweet. 18. One immediately noticeable difference between Deep Purple and Rainbow was the latter’s heavy exploration of heroic medieval fantasy themes, as immediately evidenced by the painted image of a castle surrounded by clouds on the album cover. 19. Except for the cover songs, Ritchie Blackmore and Ronnie James Dio wrote each track on the record, with the guitarist focusing primarily on the music, and the vocalist coming up with most of the words. 20. Ritchie Blackmore has subsequently joked that a more accurate titling of the LP would be Ritchie Blackmore and Ronnie James Dio’s Rainbow. 21. The instrumental album closer, “Still I’m Sad” was originally a 1965 Yardbirds song. 22. Listeners have long noted a sonic and emotional connection between the song “Catch the Rainbow” and “Little Wing” by Jimi Hendrix. Some have proposing that it’s Blackmore and Dio’s conceptual continuation of the Hendrix song. Ritchie, a huge Hendrix devotee, has never commented. 23. The high-flying, epic fantasy imagery and baroque musical influences of songs such as “Man on the Silver Mountain,” “Temple of the King,” and “Sixteenth Century Greensleeves” enormously impacted future hard rock ensembles, especially in the realm of power metal and symphonic metal. It’s tough to imagine, for example, what Manowar, Nightwish, or DragonForce might sound like had Ritchie Blackmore’s Rainbow not laid down the groundwork. The same goes as well, of course, for Dio. 24. Unhappy with the live playing of Elf drummer Gary Driscoll and “funky” bassist Craig Gruber, Blackmore decided to build an entirely new Rainbow around himself and Dio before taking the act out on the road. 25. The live performance photos of “Rainbow” in the album’s packaging are actually shots of Blackmore with Deep Purple and Elf opening for Deep Purple. 26. In the years since, Blackmore would remain the sole constant member throughout every incarnation of Rainbow. 27. For the first Rainbow tour, the band hired Scottish bassist Jimmy Bain, American keyboard player Tony Carey, and English drum sensation Cozy Powell. 28. Powell was a fixture of the UK hard rock scene, notably performing with the heavily metal-influential Jeff Beck Group between 1970 and 1972. 29. Cozy Powell remained Rainbow’s drummer until 1980, after which he continued his storied career through work with, among others, Black Sabbath, Brian May, Whitesnake, Gary Moore, Michael Schenker, and the reconstituted supergroup Emerson, Lake, and Powell. 31. As with Dio, Blackmore and Powell had similar ideas about what was funny. In Powell’s case, he was a relentless lover of good-natured practical jokes. 32. Jimmy Bain would later play a central role with his Rainbow frontman in the formation and success of the ’80s metal powerhouse, Dio. 35. Ritchie Blackmore’s Rainbow was immediately embraced by hard rock fans and proved to be a solid, if not gigantic commercial hit. The album charted at #30 in the United States and #11 in the UK. 36. Aside from the band, the visual highlight of Rainbow’s first tour was a 40-foot-long electric rainbow that stretched from end of the stage to the other. It consisted of more than 3,000 individual bulbs and was controlled by primitive computer technology. 38. “Temple of the King” has been recorded by two separate German metal acts, the group Angel Dust and the solo guitarist Axel Rudi Pell. 40. Prior to his tragic, untimely demise in 2010, Ronnie James Dio held firm that Ritchie Blackmore’s Rainbow was his favorite album during his time fronting the group.